Plenty, if you farm row crops or small grains! Saving fuel, time, machinery wear, and labor (money!). Saving nutrients that you paid for. Less runoff, erosion, and weeds. Better soil tilth and overall soil quality. Crops surviving dry weather better. A state income tax credit. Better water quality on your farm and downstream. Sound good? Here's the best part: You can do it, too. Read on to find out more. Simply stated, conservation tillage is planting crops in the soil through a previous crop's residue. Herbicides are usually used for weed control because you rarely use actual tillage. Farmers are now actually planting more acres to conservation tillage than to conventional tillage. As little as one trip for planting compared to two or more plus planting for conventional tillage. That saves fuel, time, and machinery wear (money!). On a 500-acre farm, the time savings can be as great as 225 hours, or almost four 60-hour workweeks. 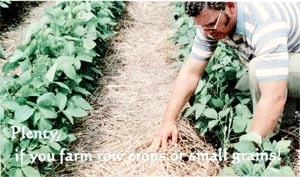 You can plant in straighter rows on hilly land; rows don't have to exactly follow the contour. Crop residues lower evaporation from the soil. This can mean up to 2 additional inches of water available to your crop in late summer. It builds up a rich layer of organic material on the soil surface. This increases water infiltration and moisture holding capacity. That means more uniform stands that can better survive dry weather. Year-round ground cover can reduce erosion by up to 90% compared to an unprotected, conventionally tilled field. Crop residues help hold soil particles and the associated nutrients and pesticides in the field, and out of your streams. And the microbes that live in organic-rich soils quickly degrade pesticides, better protecting ground water quality. You get more earthworms and other soil critters that work for free. What's the benefit? Reduced soil compaction, improved soil structure, increased organic matter, better soil tilth, and better nutrient holding capacity. Do you enjoy nature? Crop residues provide food and shelter for small game and many species of songbirds. Research shows that quail chicks in no-till fields meet their daily food needs in half the time compared to conventionally tilled fields. You may be eligible for a state income tax credit after purchasing a conservation tillage planter or drill, or converting existing equipment. For early crops like corn, well drained soils are better suited to conservation tillage than are poorly drained soils, which warm more slowly in the spring. Test your soil fertility yearly. Develop a nutrient management plan that gives credit for a previous legume crop, manure, or other land applied wastes. Use a starter fertilizer if needed. Know your weeds before you plant, and use a pre-emergence herbicide. After the crop germinates, properly identify weeds that you may need to spray with a post-emergence herbicide. Scout for weed problems to plan next year's weed control. Scout for insect pests, and apply insecticide only when natural predators don't provide economical control. Plan for next year's residue cover at harvest time. Spread the residue evenly; don't allow it to accumulate in windrows behind the combine. Finally, be patient. The benefits of conservation tillage may take a few years to notice, but they last for many years. 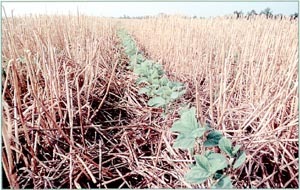 Conservation tillage is very effective for corn, wheat, soybeans, and even cotton. Pasture renovation, too. 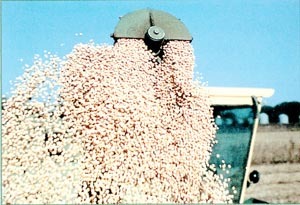 Although it often needs special equipment, conventional equipment can be adapted to leave more residue on the surface. Overall equipment and labor costs can actually decrease since you don't need a plow, disk, or cultivator, or as powerful a tractor as when you were turn-plowing. Many Conservation Districts rent conservation tillage equipment, and have staff available from the USDA Natural Resources Conservation Service and the SC Department of Natural Resources. The Cooperative Extension Service is another great source of help. All of them have knowledge based on research throughout the US, and the experience of local farmers. If you're new to conservation tillage, go slowly. There's lots of free help available from local experienced farmers, and through your Conservation District and county Extension Service offices. Call them! Even if you're experienced, call these agencies. They keep up with the latest developments that can help boost your profits. And if you have a problem, they'll help you find the answer. The first step, though, is up to you. Call your Conservation District or county Extension Service office. They have free information and technical support that can help you.